This program is the combination of on-field training and class room learning. Progressive farmers are selected and taken to various research institutes like KVK, ARS, and Private owned research centers etc where the knowledge is imparted by the experts from the field of agriculture, animal husbandry, horticulture, floriculture and many more. Progressive farmer's training are organized in the form of Interstate (outside the state of Rajasthan), Intrastate (within the state of Rajasthan) and within District visits/tours. Our team managed almost 100 participants from various parts of Bikaner District. In 2013-14 we organized various progressive farmers' training which enhanced the scope of learning for the progressive farmers. These participants were exposed to most advanced research/training centers in India. 1. NDRI Karnal, Haryana: The National Dairy Research Institute as country's premier Dairy Research institution has developed considerable expertise over the last five decades in different areas of Dairy Production, Processing, Management and Human Resource Development. 2. CAZRI, Pali, Rajasthan: The Krishi Vigyan Kendra (KVK), Pali, Rajasthan is one of the two KVKs established by Central Arid Zone Research Institute (CAZRI), Jodhpur in 1992 and deals in transfer of latest agricultural technologies to the farming community. 3. KVK, Jodhpur, Rajasthan: Krishi Vigyan Kendra is an innovative district level science based institution engaged in transfer of latest agricultural technologies to the farming community for bridging the gap between production and productivity. 4. Within District, Rajasthan: In the month of Feb. our team along with the agriculture experts conducted 2 days farmer trainings in 2 blocks of Bikaner District . Our team in the month of March again conducted 2 days farmer trainings in 3 blocks of Bikaner District. Overall the trainings were conducted in 15 villages covering 450 participants. All the above centers helped the participants to understand the criticality of agriculture and animal husbandry in the current scenario. Through the on-field training and class room learning it was clearly visible that participants had a life time experience which definitely changed the way of their working. In the month of Feb-march 2013, NYVAS organized 7 days Interstate Farmers training program. 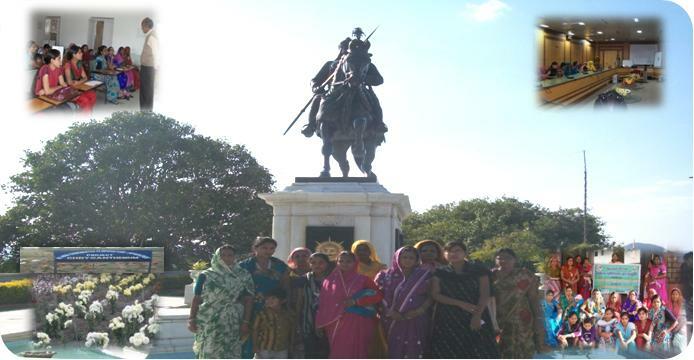 In a 140-man day’s tour program, a group of 20 women farmers of six PANCHAYAT SAMITIS of Bikaner district visited KVK, MEHSANA of GANPAT University. During their Training, both theoretical as well as practical classes were organized with special focus on Dairy production Enhancement & capacity building. Get acquaintance with latest technology bring adopted in Agriculture. In this context trainee visited “DHOODH SAGAR” a modern dairy Plant of MAHESANA, and learned Gujarat Dairy chain system & Manufacturing of milk Products in detail. A visit to the Research Farms of Agro forestry division of KVK put the detail about SILVI-CULTURE, Organic Fruit Farming and vegetable cultivation. The End of Program metamorphoses these 20 women Farmers in to CIG (Common Interest Group) ready to adopt the Innovative steps to improve their Agriculture scenario. 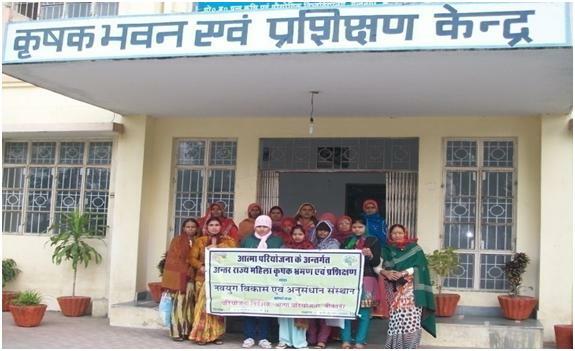 As per the guideline of ATMA cafeteria B-2B, a 7 day Interstate famers training of 20 new progressive women farmers of DUNGARGARH, LUNKARANSAR, Bikaner Rural and KOLAYAT Panchayat Samitis of Bikaner District was Organized by NYVAS with support of AGRICULTURE DEPARTMENT, BIKANER in Dec 2012. A group of 20 new Progressive Farmers visited G.B. Pant University, UTTARAKHAND with an objective of getting acquaintance with latest development in the field of agriculture sector viz. Organic farming- a new hope for sustainable agriculture. Growing fruits with organic fertilizers and bio-pesticides. Vermin-compost manufacture & its maintenance. Present the training was, one of the best training program visits, we had organized so far. Thanks to the department of Extension, G.B.PANT University. Location: - Jain Irrigations Ltd. Jalgaon, Maharashtra. Plan Schedule of Exposure Visit. (i) Knowing the Process of manufacturing of drip Irrigation Accessories like nozzle, T, Distributors etc. at plastic park, Jain Irrigation Ltd.
(ii) Hi-tech agriculture practice at various farmer of Jain Irrigations Ltd. in jalgaon and local. As per ATMA cafeteria B-2(B), a 5-day Intra state farmer Training was organized by NYVAS in the month of nov-2012. Training entitled as a “latest and modern technologies of crop Production” leads the women farmer to learn and experience not only via class room teaching but practically too. No. of farmers 3 Blocks of Bikaner district. During the training trainee attended lectures and field site visits. Of all the Research Demonstration research field of horticulture department of RCA, UDAIPUR impressed most. Professors and experts of concern department detailed the profitability of floriculture to the visitors. Medicinal plant opium poppy too created a lot of curiosity among women farmers of Bikaner. ISAFGOL, Fenugreek and maize (winter crop) were other some crops, which attracted the attention of these women.